25 June 2009: In June 2009, Albertville, Alabama (pop. 24,000) became the latest US city to pass an ordinance making English the city’s official language. Albertville Mayor Lindsay Lyons maintains the ordinance will be “a unifying factor,” bringing together immigrants and English speakers. “It will greatly enhance” the quality of immigrants’ lives, says Lyons, by encouraging them to learn English. Backers of the Nashville bill argued that it would save city taxpayers the expense of printing government materials in several languages or be required to pay interpreters. They further argued that government must encourage immigrants to join mainstream society and not live in linguistic isolation. Opponents of Nashville’s 2007 English-only ordinance argued that it would depress economic activity in a global economy and depress tourism. They also argued that such legislation would exclude and marginalize non-English speakers, noting that they are not likely to assimilate if they can’t first get basic public services such as driver’s licenses, deeds, and permits. In January 2009, Nashville voters rejected a similar English-only proposal by a margin of 56 percent to 44 percent. Current Nashville Mayor Karl Dean opposed the measure. In reality, the actions of US cities are more symbolic than strategic. Over the past 20 years, 30 US states have made English their official language and 11 others have such legislation pending. Cities, of course, must abide by the laws of the states in which they are located. For the most part, the state legislation has passed quietly, with little public notice, lost in more heated immigration-related debates such as the implications of a growing Latino population in the US, the need for border fences to keep out illegal immigrants, the economics of immigrants taking jobs from US citizens, and the expense of providing public services for undocumented aliens. English-only legislation at the state level, while generally uncontroversial, has not been innocuous for either immigrants or cities. For example, several English-only states have reduced or eliminated bilingual-education programs. In 1990, Alabama became the first state to pass English-only legislation and promptly ended multilingual testing. Before 1990, Alabama offered exams in other languages. Driver's tests, for example, were available in 14 foreign languages, including Spanish, Polish, Farsi, and Laotian. In California, which became an English-only state in 1998, such costs have been driven down to the local level. In San Francisco, Mayor Gavin Newsome in 2008 launched an extensive program to improve bilingual capacity, especially within the criminal justice system. Mayor Newsome’s example captures the dilemma facing many urban mayors in the US: their populations are becoming more diverse at the same time as support for diversity at the state level is eroding. In the 2000 Census, over 15 million people in the US said they speak English less than "very well;" most live in urban areas. In New York City public schools, for example, students speak 115 different languages. Even smaller cities are home to a remarkable diversity. In the Rochester (NY) City School District, students speak 39 languages and 69 dialects. In both New York City (pop. 8 million) and Rochester (pop. 220,000), urban leaders are closely following an English-only bill now before the New York State legislature. “This bill will have a direct impact on all programs from education to health,” said Alfredo Gonzalez, program director for the Puerto Rican Youth Development and Resource Center, a nonprofit organization in Rochester. In 2000, President Bill Clinton issued guidelines which all federal agencies "must follow to ensure that the programs and activities they normally provide in English are accessible to Limited English Proficiency persons and thus do not discriminate on the basis of national origin." In other words, the Clinton administration was against English-only policies. President George W. Bush also did not support making English the official language of the US. Neither Clinton nor Bush, however, was able to enact comprehensive immigration reform legislation. President Obama has promised to make immigration reform a priority of his administration. Many observers expect to see compromise legislation from the Obama administration, perhaps some form of legalization for undocumented aliens along with an English-only requirement. Federal direction will set the direction for the rest of the nation. In the US, federal, state, and local governments can have their own laws on the same issue. However, state law cannot be more restrictive than federal law, and local law cannot be more restrictive than state law. Federal policy, therefore, would be the national guide for all English-only policies. 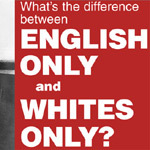 However the issue is ultimately resolved, the English-only movement is another example of the challenge that diversity presents to American society. As in most new social movements in the US, the implications are most dramatic for urban areas. Illegal Immigration has become one of the United States’ most difficult social and economic problems. More than 12 million ‘undocumented immigrants’  mostly from Mexico  are now estimated to be in the US. American cities have been dealing with this reality for years.